I'll admit that this isn't my kind of magic because this trick is all about making your spectators into suckers. But if you perform magic, someone that you're performing for will want to do this trick to you so it's a good thing to know. My understanding is that this effect is known as the "circus trick" because it was actually used at old time circuses and sideshows to scam unknowing spectators. Effect: A spectator selects a card which is mixed back into the deck. You deal cards face up onto the table, turning over each card from the top of the deck, and tell spectators that you will find the card. You deal the spectator’s card onto the table without identifying it. At some point you stop and state that the next card that you turn over will be the spectator’s card. If you were betting, you would tell the spectator that you would be willing to bet on it. To the spectator’s surprise, instead of turning over the next card in the deck, you turn over the spectator’s card that is already sitting on the table. Materials: A deck of cards. Secretly place the ace of spades on the bottom of the deck. Have a spectator select a card. In this case, we'll say that the spectator chose the eight of hearts. Have the spectator return the card (eight of hearts) back to the deck. Place the bottom half of the deck and the ace of spades on top of the card. When you deal the cards later, the ace of spades will come up just before the spectator’s eight of hearts. Deal the cards from the top of the deck face-up onto the table. When you see the ace of spades, you know that the next card is the spectator's card. You deal the spectator's card onto the table and state "the next card that I turnover will be your card." The spectators will assume that you will be wrong because their card is already sitting on the table face up. Instead of turning over the next card in the deck, you turn over the spectator's card. 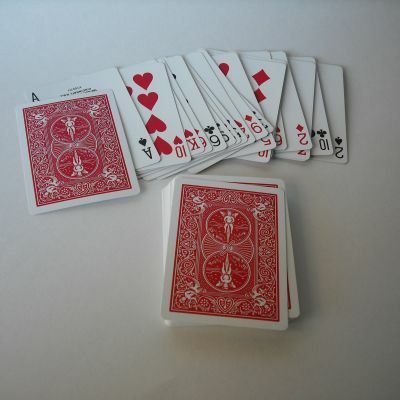 In this example, the eight of hearts.